Editor and comedian Luke Ryan has wrangled 25 of Australia’s finest comedy writers and rolled them into a single book of comedy gold. From memoir and satire, to spoofs and silliness, this collection combines the best writing of 2015 with new pieces from the funniest people working today. 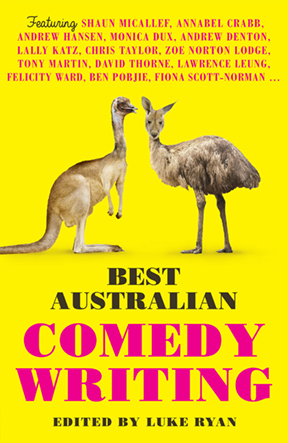 Contributors include: James Colley, Annabel Crabb, Andrew Denton, Monica Dux, Roz Hammond, Andrew Hansen, Lally Katz, Lee Lin Chin and Chris Leben, Patrick Lenton, Lawrence Leung, Tony Martin, Shaun Micallef, Zoë Norton Lodge, Liam Pieper, Ben Pobjie, Jane Rawson, Liam Ryan, Fiona Scott-Norman, Sami Shah, Rebecca Shaw, Robert Skinner, Chris Taylor, David Thorne and Felicity Ward.